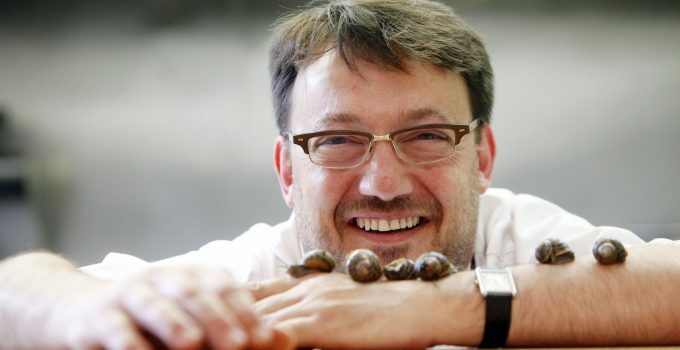 Broughton Street to open l’escargot bleu with his wife Betty in 2009. In 2015, Fred and his team renovated the area beneath l’escargot blanc to create l’escargot blanc bar à vin, a place to indulge in platters of charcuterie and cheese and a wealth of wine, which has been carefully sourced, tasted and selected from many regions in France. Provenance, sourcing and sustainability have always defined Fred’s cooking since he started his journey as a chef. Every day he works with small-scale, local businesses, traditional producers and suppliers and he’s travelled from Dumfriesshire to Barra and Shetland to meet the people who catch, raise, grow and harvest the produce he cooks with. Fred’s purchasing habits for Scottish ingredients are sustainable, economical and environmentally friendly. Instead of buying a prime steak cut, he buys the whole animal and ensures every part of it is used and nothing goes to waste. This lowers the cost price, as well as supporting the Scottish economy and reducing food miles. Purchasing whole animal carcasses also helps Fred to teach his chefs about his nose to tail ethos, how to butcher an animal correctly and how to avoid any waste. Budding Chefs’ series initiated by the Institut français d’Ecosse, which develops the gastronomic connections between Scottish and French chefs and showcases the best of both larders. It’s a two-way project, which offers young chefs the chance to experience the opposite larder as well as learning new techniques and traditions with visits to producers and cooking workshops. Fred won food pioneer award at the Scotland food &amp; drink excellence awards 2016 and is also Ambassador for Scotland Food & Drink, and a very “Special Award” at The List’s annual Eating &amp; Drinking guide awards 2014.